Yes, I believe that's what is played in that area on the speakers, I believe that's what sawboss meant. Could anyone tell me how the queue line works for this ride? I'm heading to Thorpe Park for the first time in July with 3 friends and obviously, we want to get on the same train (same row doesn't really matter) does anyone know if this is possible? Normal, then there is a point where the sides split off (A bit like Air/Galactica) you can go over the bridge or stay on the right hand side, and after that it's the usual go to an airgate, like on any other coaster. 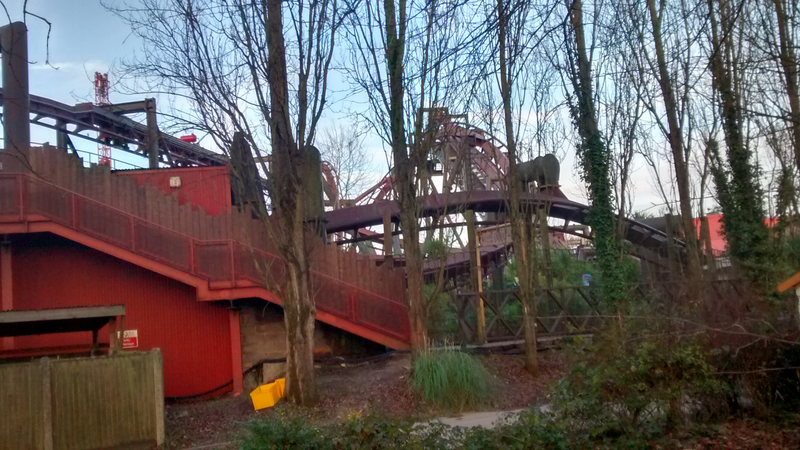 The queue's entrance leads into three queues - normal, fastrack and the old "brave it backwards" queue. Presumably, you'll be in the normal queue, which heads to the right (it's clearly signposted). From there, the queue is fairly standard (and unnecessarily long). If the extension queue is open (and I've only ever queued in the extension once), you'll have to go over a bridge which travels under the ride's lift hill, only to come back over it later. Eventually, you reach a point where you hand in your bags and any loose articles before entering the station. 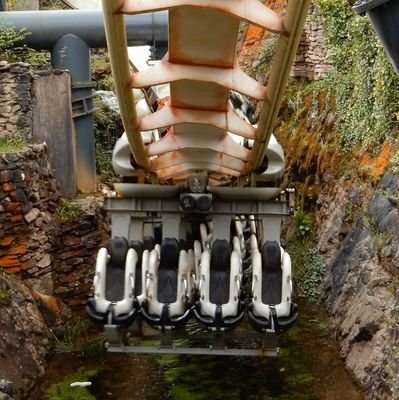 Due to the nature of the ride, the station has two sides as each row of four is separated by the track, meaning that it would be impossible to load all four seats from one gate. As you enter the station, the queue splits, with the right-hand queue heading over a bridge to the far side of the station and the left-hand queue heading in a straight line. Sometimes, you are given the choice as to which side you pick, but not always. Whenever possible, I choose not to cross the bridge, as I find the ride more enjoyable if I board from the nearside station. Whatever happens, you should all choose the same side. After a short queue in the station, you will reach the air gates (the gates you wait in prior to boarding), which can hold 4-6 people. Each gate represents a numbered row from 1-7. At this point, you will need to choose your rows. As two people board each train, the four of you will need to split into two pairs and wait in different rows. In order to be on the same train, you should ensure that there is an equal number of trainloads in front of both pairs (eg 4 people in front of each pair). All being well, you should all end up on the same train and should all be sitting next to one other person from your group. Which side would you say has the best ride? And would you do best side first or worst side first? Edge seat, right-hand side, either back or front row (they're about equal IMO) for me! Back row, right, outside seat, some major G-forces on the zero-G roll and throughout. Front row, right or left, outside seat for an amazing build up, great views at the top, amazing headchoppers (especially on left) and building tension at the dive loop drop. Looks like The Swarm had a bad end to the day. It was listed as closed for a fair bit of the late afternoon. When I left at 5:30, one train was stopped at the top of the lift hill empty. I assume they had to evacuate it as can't see any reason to position a train up there otherwise. Assuming it did have an issue, hopefully nothing too serious. Edit: All back up and working again on the next operational day! The Swarm was listed as "Opens from 11am" today. Anybody know if this was due to an event, or if Thorpe are now testing the Alton approach of staggered opening. It would be strange if it was the staggered opening case, given it's half term. Normal maintenance related issues typically get listed as "Come back later". It could have been planned maintenance that they knew would cause the ride to open later and so therefore thought it was a better approach to say it was opening at 11. I wouldn't read to much into it for now. If it continues to say it everyday for the next week or so, that's when you have to worry. I shall keep a suspicious eye on it. Pitchforks are at the ready though, because Swarm is an excellent crowd swallower in the morning leaving Inferno and Stealth empty for the rest of us! I'd love to give them the benefit of the doubt, and assume there was something other than staggered openings to blame... but this is Merlin we're talking about, so... and planned maintenance should be done after park close, so even that isn't an excuse. It'll be easy to spot tomorrow. I'd be very surprised if they did try and implement staggered opening - but then management do like to be surprising at times! Looks like it might have delayed opening on Sunday, as there's a triathlon happening in the morning and previous year's pictures seem to show them using the field behind Swam and the path alongside the conference center for it. But we shall see - they might all be done by park opening. I did just see a tweet saying something along the lines of they were sorry that it took longer than usual to get onto the island this morning, so are extending the opening to 7pm? Yep. They messed up the annual pass collection so badly that it was taking two hours plus to get in. They ignored it for a fair while until a BBC and local reporter started tweeting those in the queue, then magically management arrived with water and more staff to run the ticket collection. The first drop into the roll is one of favourite sections of any ride. I've not ridden anything that gave me the sense of flying as that section does. It just needed to be a little longer with maybe another airtime section to be perfect.